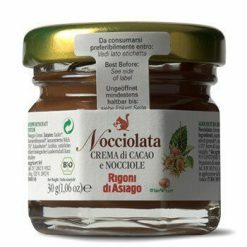 A delicious, soft and creamy spread made with organic Italian hazelnuts, cocoa and milk using a time-consuming process. Nocciolata is made with organic sunflower oil rather than palm oil like some other similar spreads. An exclusive and traditional recipe, Nocciolata is a smooth, light and delicious organic blend of hazelnut and chocolate, containing no artificial flavourings or preservatives. In February 2014, Time ranked Nocciolata No. 1 amongst eight hazelnut chocolate spreads. The result of two years of research, Nocciolata uses high quality organic Tonda Romana hazelnuts. Its distinctive flavour and texture are due to a slow manufacturing process, which is essential for bringing out the flavour of the hazelnuts and the chocolate. It contains no gluten, palm oil or hydrogenated fat, and is a source of calcium. Ingredients: Organic cane sugar, organic hazelnut paste, organic sunflower oil, organic skim milk powder, organic coacoa powder, organic cocoa butter, sunflower lecithin, organic vanilla extract.